The Community and Rural Education Route (CARER) – Llwybr Addysg Wledig (LLAW) – is a new option for existing year 3 students and will see the first ever ‘year-long’ placement in a rural/community environment. 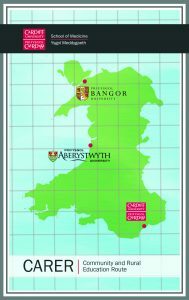 Starting in September 2018 our first group of 13 students will be located in the University towns of Bangor and Aberystwyth where they will be immersed in the clinical environment working closely with experienced primary and secondary care providers to achieve the same School of Medicine learning outcomes as colleagues across their year group. This style of learning is known internationally as a ‘longitudinal Integrated clerkship’ or ‘LIC’ and has been utilised in countries including Australia, USA and Canada to great success. Cardiff will deliver the first programme of its kind for Wales (and only the second of its kind in the UK) ensuring that we remain at the very forefront in education delivery. The first Group of students taking part in this newly developed pathway will have a real opportunity to experience being part of a community – getting to know the people and complexities of healthcare in the rural environment. This pathway will also give rural patients the chance to get to know the students and build strong links with healthcare education and the chance to influence their future doctors.